Gina and Rachel are holding each other accountable today. Who is holding you accountable? Are you holding yourself accountable? 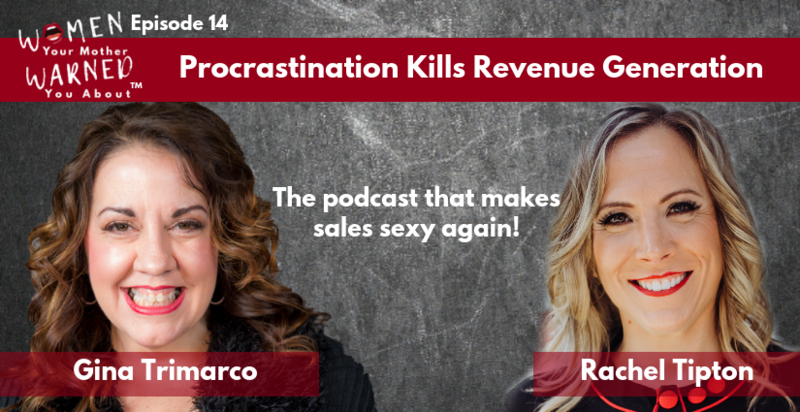 Today’s episode is about the fears that lead us into procrastination and how that procrastination kills our ability to generate revenue. It doesn’t matter if it’s a rote task that you hate to do or your passion project, procrastination can strike at any time. Understanding the root causes BEHIND putting off work is essential to getting back on task and completing the thing that will make you money. Listen for updates on what Gina and Rachel are doing (or avoiding doing) and get strategies for moving past your fear, the “quick response drug” and the “delegation demon” so that you can FINALLY get to your finish line. 17:38 – You know how to do something super simple that is complicated to others. For more Gina, Rachel and Women Your Mother Warned You About visit our website! Gina Trimarco is CEO/Founder of Pivot10 Results (training and strategy company) and Carolina Improv Company (comedy club and school). She has 25+ years of experience in marketing, sales, operations and people training. Gina combines street smarts and improv comedy skills with her experience in the corporate and entrepreneurial worlds, which sets her apart from her competition. A true Chicago city girl, her much older father trained her in sales starting at the age of 10, working in flea markets. As Managing Principal of Walters Dev Group, LLC, Keith currently assists companies via board and advisory roles. Keith has spent more than 30 years using a strong entrepreneurial focus to lead, advise and grow very successful businesses. His focus on operational excellence brings stability into organizations he leads and guides. Through a unique management system focused on company growth and strong culture development Keith helps build businesses that are true talent magnets. Women Your Mother Warned You About™ is part of the Sell or Die Podcast Network. Check out these other amazing SORD podcasts. Sign up for our newsletter and get this free guide instantly!